All Praise the Field Campaign, Few Practice It! New Orleans In recent years genuflecting in the direction of the “ground war” in politics has become almost routine. Sadly, much like other religions and church attendance, a whole lot more people praise field operations as critical to winning elections, than actually walk the talk and put the program in practice. As more and more of this activist moment is focused on electoral work, it’s worth reprising lessons learned and ignored. We’ve talked before about the uphill push that Becky Bond and Zack Exley described in their book, Rules for Revolutionaries, as they tried to get support for their field-and-phone program within the Sanders Campaign. This issue of Social Policy in the mail features a piece by Peter Haberfeld called “The Sanders Campaign: Notes from Inside Out on a Local Campaign.” He also details the tensions between campaign directors and the experienced grassroots folks in the Berkeley and Oakland area that were trying to emphasize the ground game to deliver for Sanders. They often felt the web-attention was gobbling up their strategy. Both sets of campaigns describe having to virtually go rogue in order to get the job done. Bond and Exley saw much of the millions that was spent by the Sanders Campaign the same as pouring money down a rat hole. A close look at the Clinton-Trump contest certainly shows that Trump was all-media-all-the-time, but it was also clear that Clinton could not duplicate the Obama ground game of 2008 and 2012. All of this came rushing back at me when I opened an email from Judy Duncan, head organizer of ACORN Canada, sending a somewhat dated piece, two-and-a-half years old by David Broockman and Joshua Kalla who were then graduate students in the Department of Political Science at UC Berkeley writing in Vox. I read the piece with fresh eyes, partially because then ACORN was new to Scotland and late to the dance on the independence election, but Broockman and Kalla hit the nail on the head in pulling back the covers on the reality of the field program, where many of our leaders and organizers volunteered, and many other programs pointing out that the “arms” race to record “knocks” was obscuring the importance of non-scripted, quality conversations with voters by the doorknocking canvassers. They cite the now famous study several decades ago by Alan Gerber and Don Green in 1998. The professors randomly assigned voters to receive different inducements to vote: some received postcards, some received phone calls, some received a visit from a canvasser, and some received nothing. The experiment found that voters called on the phone or sent postcards were not noticeably more likely to vote than those sent nothing. But canvassing was different. Just one in-person conversation had a profound effect on a voter’s likelihood to go to the polls, boosting turnout by a whopping 20 percent (or around 9 percentage points). The nearly two decades since Gerber and Green’s first experiment have consistently borne out their finding that personal conversations have special political potency. Hundreds of academics and campaigns have tested the impacts of various campaign tactics with randomized field trials. 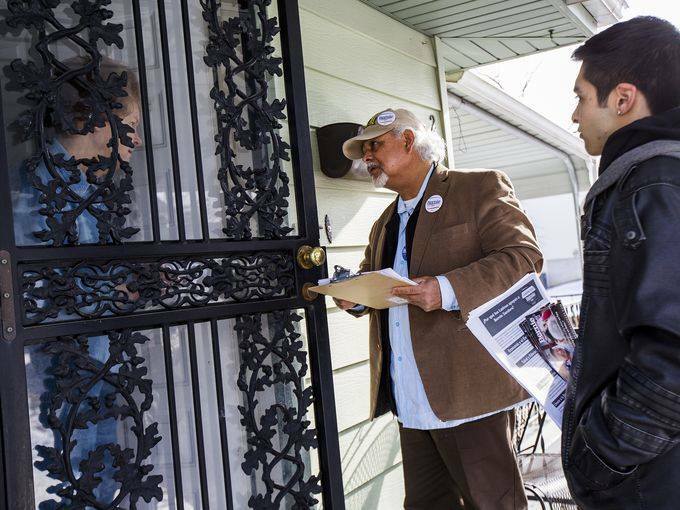 High-quality canvassing operations emerge as consistent vote-winners. On the other hand, impersonal methods have consistently failed to produce cost-effective results, no matter how you slice the data or which populations researchers examine. So, yes, as Bond and Exley argue, with the right kind of volunteer base and training, it is physically possible to get past micro-targeting and “hit every door,” if that is the campaign plan, but it will still require people who have been to the rodeo and know how to ride. This entry was posted in ACORN, ACORN International, Community Organizing and tagged field campaigns, Sanders by Wade. Bookmark the permalink.